Soil to stove: Sweet, golden and crunchy - what's not to love about corn? Sweet, golden and crunchy - what's not to love about corn? I love corn on the cob. Steam it for 10 minutes and watch the butter melt, crunch the sweet corn kernels between your teeth and reach for the napkin as the juice trickles down your chin. There's lots to love about corn but one of the things I like most is watching my children devouring it. We ventured up to North Jutland this summer - really far north - all the way to Grenen, north of Skagen, at one point. It's stunning up there: the water, the light, the sand dunes, the wind - its other wordly and its easy to see why artists flock there. We were still in North Jutland at the end of the summer break as the maize harvesting began. The golden yellow cobs were a regular feature on the dinner table and my children just couldn't get enough. Their sweet taste is hard to resist but the high sugar content does actually make corn a great energy food. 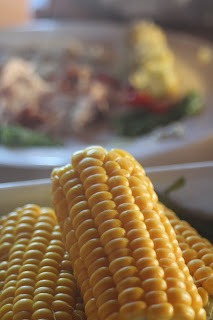 It is also rich in vitamins A, B and C.
The corn season here in Denmark is short and so enjoy them whilst you can! Right now, Aarstiderne has a MajsPosen (corn bag) with 8 cobs, which costs 69 DKK. Click here to order. The corn can be kept for 1-2 days at room temperature or up to 8 days in the fridge. Enjoy!